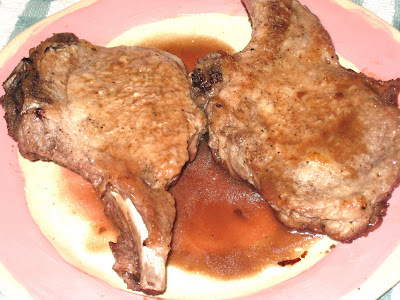 Remember my Pork Chops Braised in Bock Beer? They're just as good braised in Red Wine. I used the same technique and substituted Charles Smith Wines' "Holy Cow Merlot". Sweet cherry, pipe tobacco, and spice. Cool stone, smooth as velvet, TASTY AS HELL! In this case, you can believe the hype. This is one good wine, in a glass or on your plate.